Ted Gillis started out this day third in chips with about 1.1 million with some real talent to contend with in the final 12. It took us a few hours to get down to an official final table of nine, but when we got there players started falling quickly. 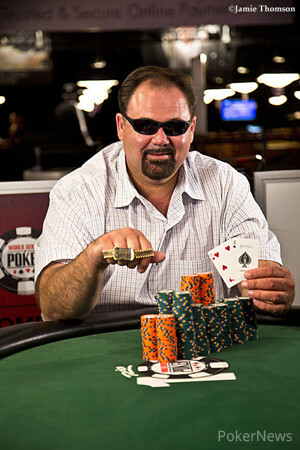 At the end of the day, Gillis was the man with his hands on the WSOP gold bracelet and the top prize of $514,027. Gillis is new on the tournament scene. He has a single WSOP cash prior to this one — a small cash in an event just like this one last summer. His lifetime earnings are just $10,538 ... until today. From Houston, Texas, Gillis has just earned himself some truly life-changing money. The bulk of Gillis' chips came to him late in the day. He coasted through the final table at about the middle of the pack, but by the time he knocked out Dejan Divkovic in third place, Gillis had gained about two thirds of the chips in play to enter heads-up play. Just 27 hands later and Gillis had claimed his victory. Day 1 on Saturday received 2,086 total entries to create a prize pool of $2,816,100. 233 players survived the initial day and it was only half an hour into Day 2 that 216 players made it in the money. 10 levels later and only 12 players remained to bag up chips for the final time in the event. It was an event of double knockouts. 14th- and 13th-place finishers Matt Ditonto and Max Silver were both eliminated in the same hand. Then, on Day 3, 12th- and 11th-place finishers Ron Mcmillen and Gregg Merkow both met their demise when they ran into John Hennigan's kings. Not to miss out on the trend, Dylan Thomassie and Edison Shields (ninth and eighth) both exited the tournament at the same time when Divkovic turned quad kings. Thanks for following the PokerNews live update blog and make sure you come back to keep up to date on the dozens of events still to play in this summer's World Series of Poker. Hand #140: John Hennigan's run in the tournament has come to an end, as he was just defeated heads up. Hennigan pushed all in and Ted Gillis made the call with the huge chip advantage. The board ran out in Gillis' favor with . Hennigan, a two-time bracelet winner with six cashes in last year's WSOP, was eliminated in second place and headed to the cashier to collect $319,993. Hand #134: Ted Gillis got a walk. Hand #135: Ted Gillis raised to 160,000 and John Hennigan pushed all in to win the hand. Hand #136: Ted Gillis got a walk. Hand #137: John Gillis got a walk. Hand #138: Ted Gillis got a walk. Hand #139: Ted Gillis raised to 160,000 and Hennigan called to go to a flop of . Hennigan check-called Gillis' bet of 160,000 and the turn came . Both players checked and the river was the . Hennigan bet 150,000 and Gillis made the call with . Hennigan mucked. Hand #128: Hennigan raised to 160,000 and Gillis called. The flop was the and Gillis checked. Hennigan bet 100,000 and Gillis called. The turn was the and Gillis again checked. Hennigan bet 225,000 and Gillis folded. Hand #129: Gillis raised to 160,000 and Hennigan three-bet to 350,000; Gillis folded. Hand #130: Hennigan raised to 160,000 and Gillis three-bet to 350,000. Hennigan called and the flop was and both players checked. The turn was the and Gillis bet 750,000. Hennigan called and the fell on the river. Gillis put out a big bet of 1,500,000 and Hennigan quickly called. Gillis tabled for the full house and Hennigan mucked. Hand #132: Hennigan raised to 160,000 and Gillis called. The flop was the and Gillis checked. Hennigan bet 100,000 and Gillis called. The came on the turn and Gillis checked. Hennigan moved all in and Gillis folded. Hand #118: Ted Gillis raised to 150,000 and won the pot. Hand #119: Gillis got a walk. Hand #120: John Hennigan raised to 130,000 and won the blinds and antes. Hand #121: Hennigan got a walk. Hand #122: Hennigan raised to 130,000 and Gillis called to go to a flop of . Gillis checked and Hennigan bet 60,000. Gillis raised to 200,000 and took down the pot. Hand #123: Gillis raised to 155,000 and Hennigan three-bet to 400,000 to win the hand. Hand #124: Hennigan raised to 130,000 and Gillis three-bet to 400,000 and scooped up the pot. Hand #125: Hennigan got a walk. Hand #126: Hennigan raised to 160,000 and Gillis called. The flop came and Gillis check-folded Hennigan's bet of 100,000. Hand #127: Gillis bet 160,000 and Hennigan made the call. The flop was dealt and Hennigan check-folded the bet of 225,000. Hand #114: Gillis raised to 120,000 and Hennigan called. The flop was and both players checked. The turn was the , Hennigan bet 100,000 and Gillis folded. Hand #115: Hennigan called and Gillis checked his option. The flop was , Gillis led and Hennigan folded. Hand #116: Gillis raised to 150,000 and Hennigan called. The flop was and both players checked. The turn was the and Hennigan bet 150,000 and Gillis called. The river was the and Hennigan bet 275,000. Gillis raised to 675,000 and Hennigan folded. Hand #117: Hennigan raised to 130,000 and Gillis called. The flop was and Gillis checked. Hennigan bet 130,000 and Gillis folded. 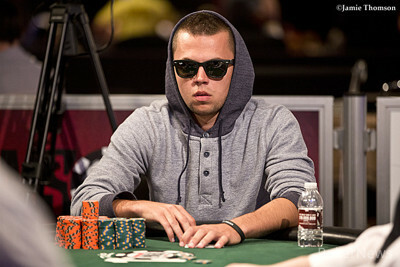 Hand #113: Dejan Divkovic has been eliminated from the tournament. John Hennigan raised to 120,000 from the button and Divkovic pushed all in from the small blind. 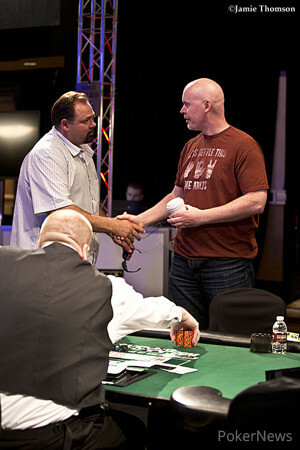 Ted Gillis was sitting in the big blind and pushed his big stack all in over the top to force Hennigan out of the way. Both players made two pairs on the flop of . The turn of and river of didn't help Divkovic catch up and he lost all of his chips. 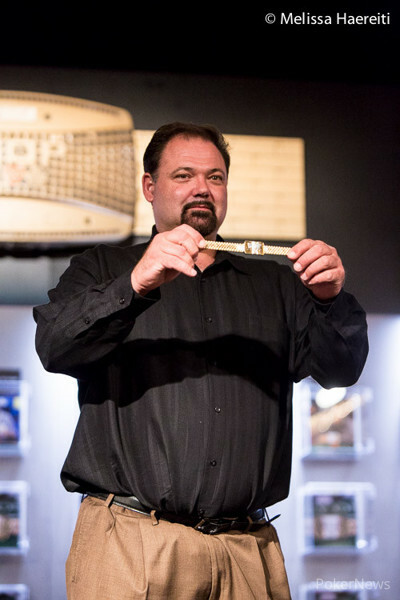 He headed to the cashier to collect $222,429 for his third-place finish.